There are reasons why more and more businesses are opting for managed IT services, as opposed to break-fix—reasons that include proactive management, cost-savings, quality, breadth of service, and peace of mind. As small business dependence on technology increases, so must the focus on IT-related issues. Most companies cannot function without reliable, secure internet and computer systems. Many are storing increasing volumes of data digitally, which makes IT security even more important for themselves and for the customers they serve. Managed IT services is commonly likened to automobile maintenance. You take your vehicle to the mechanic routinely in an effort to get ahead of issues that could affect its performance and longevity. Not to mention that failing to do so could cost you a fortune. A growing number of small businesses are approaching IT in a similar way, opting for ongoing, routine maintenance, rather than only calling the experts when something breaks. Let’s compare the break-fix approach with managed IT services and consider how a long-term, strategic approach to IT could benefit your business. Break-Fix: As the phrase implies, in this reactive approach IT vendors only engage with clients when something is broken and needs attention. Managed IT Services: With the managed services model, clients pay monthly to retain ongoing, proactive IT support. This typically covers everything needed to make sure business technology runs smoothly. With the managed services model, your IT partner takes a hands-on approach to preventing technical issues that interrupt productivity and cost your business time and money. Everyone is incentivized to get ahead of problems and to create the most secure and efficient systems possible for your business. Together, you’ll avoid potential IT hiccups, rather than just scrambling to fix them when they occur. The break-fix model locks you into always putting out fires. The atmosphere can be stressful and frantic. There’s no time to discuss long-term goals or ways to help your business run more smoothly. With managed services, the goal is to avoid those fires in the first place. You can trust the outsourced IT services partner is doing everything it can to help your business. Cyber crime is projected to cost businesses an estimated $2 trillion by 2019. No company can afford to ignore this. Criminals unleash new strains of malware all the time. The number of zero-day threats discovered has been steadily rising, according to research from Symantec. Businesses must monitor and update their layers of protection continually. With managed services, IT specialists do this for you and work to minimize the chances that you will become one of many businesses that lose time, money, and data to cyber criminals. For the most part, when IT firms work on a break-fix model, they are not incentivized to help clients avoid future problems. Of course, a reputable, trustworthy IT partner should still do its best to provide exemplary services, but there is something to be said for the alignment of goals that the managed IT services model creates. Both parties work together to create and maintain the best systems possible—systems that run smoothly and at optimum speed while remaining malware-free. If you are only calling your outsourced IT services provider when something stops working, you probably aren’t taking time to discuss all of the other ways that it can help your business. Managed IT service providers can do so much more than preventing fires, including handling IT security, backups and disaster recovery, network and computer performance, remote access, the IT needs of new employees, and compliance-related issues. A managed services approach can prove more cost-effective, especially long-term, than break-fix because the client and the outsourced IT services partner work together to stay ahead of what otherwise might develop into more costly problems if left unmanaged. The right outsourced IT services partner can also drive cost-savings by helping you make smart purchasing decisions about things like equipment, software, and storage. With IT, the stakes are high. It is easy for someone who isn’t an expert to make a mistake of consequence. One of the biggest benefits of managed services for busy professionals is peace of mind. They can check “IT” off their to-do list and rest assured their company’s IT needs are being handled professionally. With the managed IT services model, your business gains a dedicated team that is constantly thinking about your company and its interests. Anderson Technologies, a St. Louis IT consulting company and managed IT services provider, is invested in its clients’ success and takes an active and ongoing approach to ensuring it. To learn more, call 314.394.3001 or email info@andersontech.com today. We recently published a guest article about how to increase the digital health of your business on the technology news website, ReadITQuik. Mark Anderson shared some of his expert IT consulting advice with recommendations of immediate actions to help protect your business. Every time you or an employee logs on to a public Wi-Fi network, the safety of your business is potentially compromised. These tips will help protect your data from rampant cyber security threats on public wireless networks. The explosion of free public Wi-Fi helps people stay personally and professionally connected. However, many of these networks are not secure and make tempting targets for cyber criminals looking to steal your personal information. Alarmingly, 60 percent of Americans believe their data and identity are secure on public Wi-Fi, according to research from Symantec. This is unequivocally false! Data shared on public Wi-Fi is usually unencrypted, which makes it simpler for cyber criminals to access. Americans are three times more likely to connect to public Wi-Fi if it is free, according to a survey by the Identity Theft Resource Center, but free isn’t the same as safe. 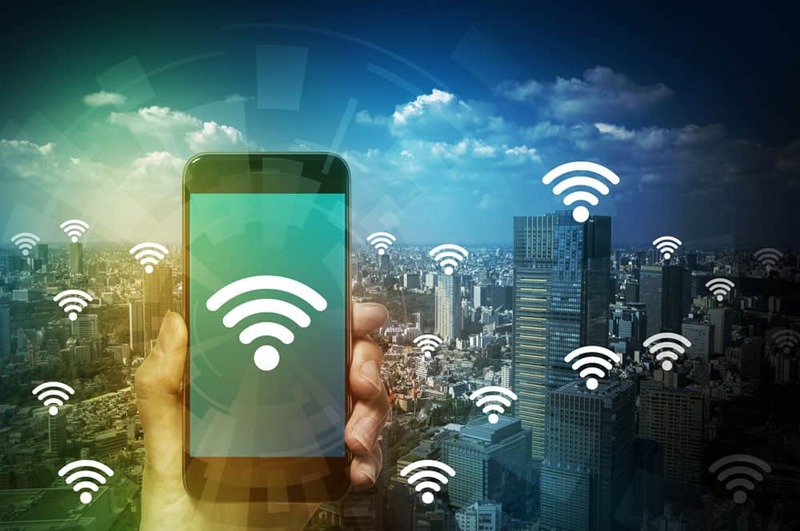 Let’s take a look at some of the cyber security threats found on public Wi-Fi networks as well as what can be done to protect yourself and your business. Sniffing: Hackers use packet sniffers to intercept the information sent from your browser to the server. “Packet” refers to the bundles of data that hackers capture from the network. Data could include information that enables them to compromise you or your business’s security, such as passwords or user IDs. Man-in-the-Middle Attack: In this type of hack, criminals intercept your communication while you are completely unaware. Examples include eavesdropping on, or even altering, communication between two parties and using malicious tools to come between you and a digital resource, such as a website or email account, in an effort to gain access to your private information. Evil Twin: This is a Wi-Fi network that appears to be legitimate but is actually created by a criminal to pave the way for cyber crimes, such as man-in-the-middle attacks. These rogue networks often have similar names to legitimate hotspots in the area. Sidejacking: With this nefarious tactic, hackers use sniffing software to steal session cookies (information on your browsing activity) and then hijack your session. For example, if you’re logged in to your favorite shopping site and hackers sidejack your session, they could make purchases using your credit card information; or if you are sidejacked while active on Facebook, the perpetrators could send messages to your connections or post dangerous links to your feed. The good news is that the thieves are stealing specific cookies and not your username and password, assuming those are encrypted. The bad news is it may not be immediately obvious that you were targeted, and the criminals could use the cookie to access your account at a later date. If possible, use a virtual private network (VPN), which encrypts all of your network traffic data. The majority of business-grade networking hardware have the capabilities to support multiple VPN connections. A managed IT services provider can help you assess the right solution for your business. Reduce your digital profile by only performing “must-do” activities. For example, use public Wi-Fi if you have to get an important email out, but don’t pass the time with leisurely online shopping. Try to limit your browsing to sites that are verified secure with the “HTTPS” designation, and avoid online banking over public Wi-Fi connections. Ensure your devise doesn’t “accidentally” connect to an at-risk network by turning off automatic connectivity features, which are common on many mobile devices. Perhaps your laptop is configured to share files with others in the office. Disable any file sharing and temporarily turn off all cloud-based file services (such as Dropbox, OneDrive, Google Drive, etc.) before logging on to a public network. Otherwise you may make it easier for hackers to access your information. There are tools, both free and paid, that can encrypt your data when you access a public network. You can encrypt passwords, files, or even your hard drive. An IT specialist can help you determine the right tools for you and your business. Software can’t protect you from shoulder surfers or zero-day threats, but it will detect many forms of cyber security threats should your device become compromised. Be sure to not only install anti-malware and anti-virus software but to also update it regularly so you stay protected as threats evolve. Firewalls protect your technology from attacks and block unauthorized access to your network. When logging on to public Wi-Fi be sure your device’s software firewall is turned on. If you have to use a public computer, say at a hotel, conference center, or library, abide by the tips above. Additionally, clear your history and temporary internet files after your session. It isn’t realistic to expect yourself or your employees to avoid pubic internet entirely, but it is imperative that everyone understand the risks and take necessary precautions to protect themselves. Check out this in-depth guide to public Wi-Fi on the technology site Secure Thoughts. Anderson Technologies, a St. Louis IT consulting company, helps educate small businesses about safe online practices. We’ve even created this free eBook to get you started. Contact us today at 314.394.3001 or info@andersontech.com to discuss your business Wi-Fi safety or any of your IT concerns.